Phi Phi Island cheap accommodation is a key search term in the season when travellers on a budget and students arrive in Thailand looking for a glimpse of 'The Beach', tremendous scenery and a cool place to stay. Phi Phi Island is a travellers mecca with most people just needing 3-5 days accommodation to experience paradise. Phi Phi Island cheap accommodation is centred on the main Phi Phi Don Village where the ferries land from Phuket and Krabi. This small bustling bazaar-like-mini-town is home to most of the guesthouses, hostels and dormitories, ideal for cheap stays. There are some further cheap bungalow resorts around the outskirts of the Phi Phi Don village that make good variation. 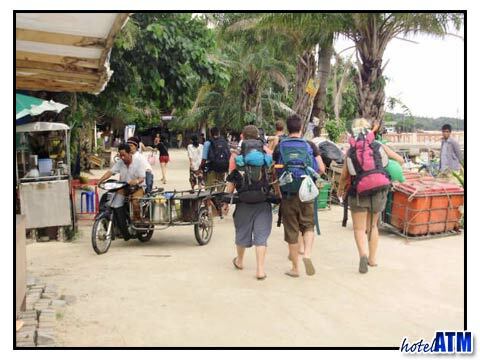 This Phi Phi Island cheap accommodation zone is also the place for a great variety of cafes, restaurants and beach bars. When you add in the opportunity to eat the local curries and food around the main fresh market you have the perfect experience. You can get great deals if you just arrive at the ferry pier and 'Walk in' but all to often the best value guesthouses, hostels and dormitories get taken or are booked up before you arrive. 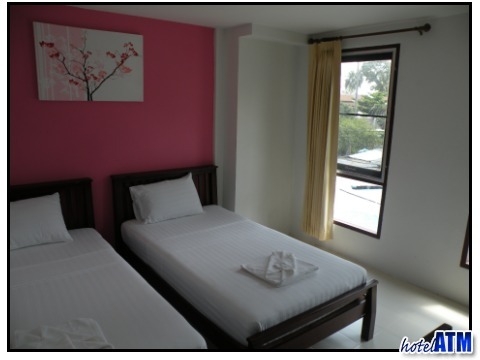 If you want to get cheap accommodation like this, make sure to take the morning ferries from Phuket or Krabi as the availability issues are compounded when travellers arrive in the afternoon. When you arrive be prepared to be shown around for a while, while you get the place that works for you. Often the cheapest accommodations is the dormitory style The Rock Backpacker but this doesn't suite all and there are only 20 beds so it is difficult to get into. Also note; the small family run guesthouses increase prices when the island is full so be prepared. Some of the best and cheap accommodation to be booked can be found at the following places. PP Casita has a pool and is great value for money and is definitely cheap accommodation, just 50 meters from Loh Dalum Beach. Prices here can be cheaper than walk-in prices when the island is full but the quality is night and day better. This also goes for the following choices; Tropical Garden Bungalows, The White, or the fan rooms at the beachfront Andaman Beach Resort. The main luxury Phi Phi Island cheap accommodation can be found in Low season or from May 1st till 31st October. During June and September there are monsoonal weather conditions that, all though not continual, mean there is a lot of rain and wind. However May, Mid July till Mid-August and October can be considered great value or cheap accommodation because you can have many high-season-like-weather-days and only be paying low season rates which are 40% less than high and peak season. On top of this, the top resorts of Zeavola Phi Phi Resort, Holiday Inn Phi Phi Island and Phi Phi Island Village Resort And Spa offer free nights and discounts in their Phi Phi Hotel Deals to try to make the resorts full. These deal vary every year but can include Free Night Specials, Fixed Night Promotions, Special Discounts, Early Bird Offers and Honeymoon offers. There are some cheap places to stay near the pier where the dive boats leave for their tours. It is also close to where many of the dive centres organize their confined water training for their PADI Open water courses. Ivory Phi Phi, PP Insula and the Phi Phi Inn Guest House, are less than 100 meters from Moskito diving, Barakuda Diving, Visa Diving, Hippo Diving and Scool Divers.